Sydney, New South Wales, Australia, 10th April, 1997. Powwow: Native American Celebration is a commemoration of the life, culture and spirit of a people, a collection of fifty-five images by Andrew Hogarth that capture the pageantry, the people, the joy and tradition of Native America. A native of Scotland, with the remnants of a warrior culture and the rhetoric of dispossession still resonant, it was perhaps inevitable that Hogarth’s life journey would be inextricably linked with the exploration of his restless spirit. His journey has involved travel to remote and unforgiving places meeting a pantheon of engaging characters and listening to countless stories. Most importantly it is the development of a deep and engaging empathy with indigenous cultures that marks his journey and is profoundly evident in his work. The quality of Hogarth’s work is exceptional, not only are his images beautifully composed and exposed but radiate both knowledge and spirit. Hogarth’s photographs present a clear-eyed view of Native America that cut through the stereotype, confusion and ambivalence that is often encountered in images of indigenous people. His images are felt rather that viewed and known rather than simply observed. The powwow circuit through North America and Canada is a series of events and celebrations usually held during the warmer summer months ranging in size from small and provincial to large gatherings filling arenas or boasting hundreds of tepees. Often misunderstood, usually underestimated and sometimes disregarded simply as a fairground curiosity, a powwow has the capacity to reward those with a well balanced mix of patience, respect and curiosity with a rich and memorable experience. 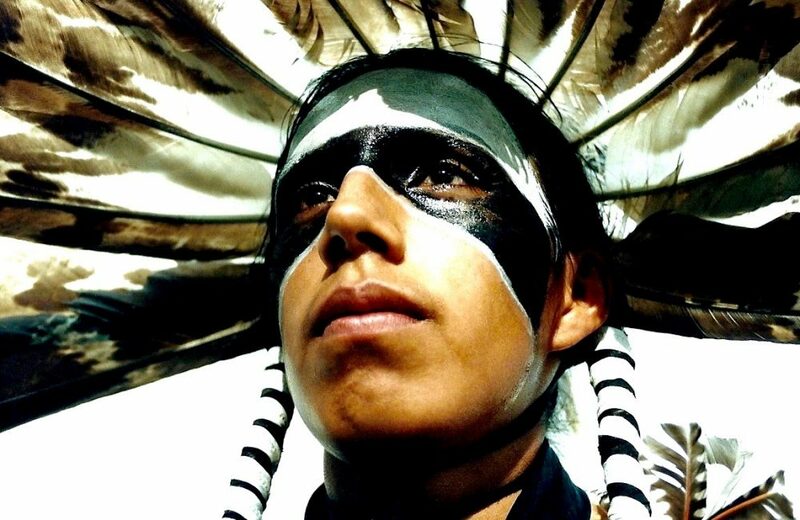 First and foremost powwows are an opportunity to gather together with family, friends and the community to celebrate life and culture through music, dance and costume. Each powwow has its own flavor, which varies, from area to area and year to year. Some gatherings have a special spirit where the most powerful and lasting impression is one of the interconnectedness of the people, their history and the land. To have the opportunity to share in such a gathering is indeed a privilege. In Hogarth’s images of powwow our senses are awakened to the beauty of Native America and we are reminded that life has changed both very much and very little. His images concentrate on the people. The insistence on close portraiture captures the humanity, strength, determination and pride of his subjects while acknowledging tradition in their attire, the everyday and sometimes humour in their accessories. Rather than dominate Hogarth provides a vehicle for his subjects to tell their own story. If indeed the eyes reveal the hum of the soul, then amid the feathers and paint the eyes of Danny Reyes encompass the eons of history, Jordan Guinon the joy of childhood, Adam Nordwall the determination of youth, and Sallie Black Eyes the wisdom and compassion of the elders. In 1998 Hogarth received the opportunity to share Powwow with a broad audience when he was one of fourteen artists worldwide whose work was selected to join Exhibits USA national touring program. Powwow: Native American Celebration debuted in the United States of America in October 2000 at the Matin Luther King National Civil Rights Museum in Memphis, Tennessee. 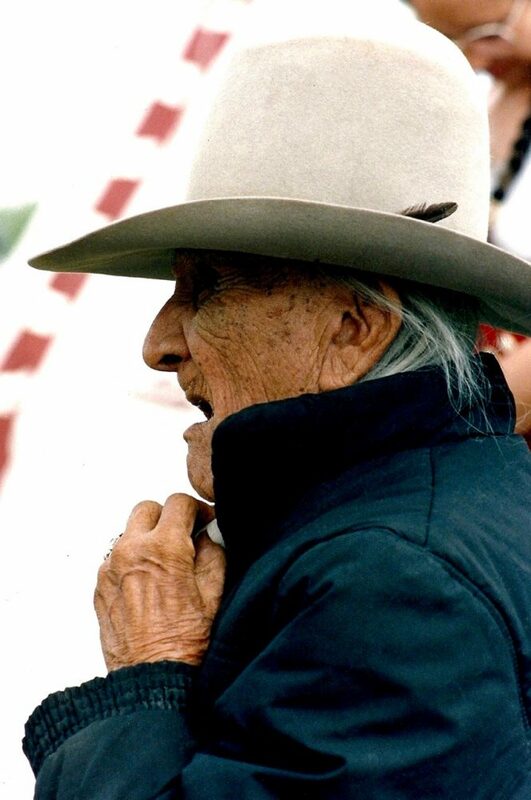 His three year tour encompassing sixteen exhibitions in museums, galleries, universities and civic centres across thirteen states from Oregon in the northwest to Florida in the southeast received universal acclaim by numerous diverse Native American communities and the broader community alike. The photographs in Hogarth’s collection offer a brief but powerful glimpse into the world of the powwow, an important cultural aspect of Native American life today.